We're celebrating the return of the most recent series in Gerard Way and Gabriel Bas The Umbrella Academy: Hotel Oblivion. Taking inspiration from Apocalypse Suite, Dallas, and Hotel Oblivion, we've designed new products to reflect the strangeness and the beauty! Netflix series to debut soon! 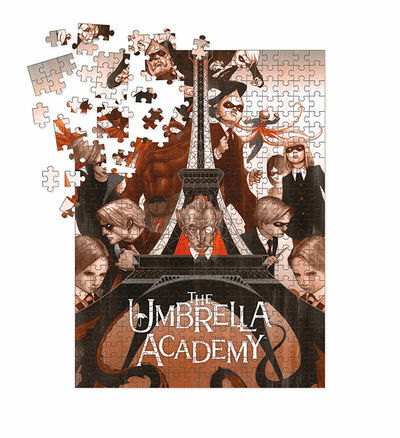 Deluxe 1,000-piece puzzle featuring gorgeous art by James Jean from the cover of the very first issue of The Umbrella Academy. The completed puzzle measures 20'' x 27'' and is printed in a high-quality matte finish. The puzzle pieces are secured inside a bag and packaged in a full-color box.